Fancy forty-one tales and three poems from out of my head? 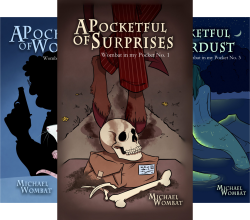 Read tales of Robin Hood, torture, unicorns, death, poo, toffee apples, giant spaceships, stuffed dogs and more. With additional stories from the highly talented Alex Brightsmith, KJ Collard and Ellie Cooper, this collection might just burst all over you while you’re reading. So, you know, sorry about that. If you get the PAPERBACK HERE, or download it for your KINDLE HERE, I will adore you forever. He did a brilliant job. I love how the fold between front cover and spine form the corner of a wall spattered with blood. That wonky ‘THE’ emphasises the original subtitle of this book: forty-one tales of a world askew. It’ll certainly stand out amongst a slew of other covers on Amazon, and be easy to find on your bookshelf. Notice also that my running man motif continues, here making his first appearance on the spine. 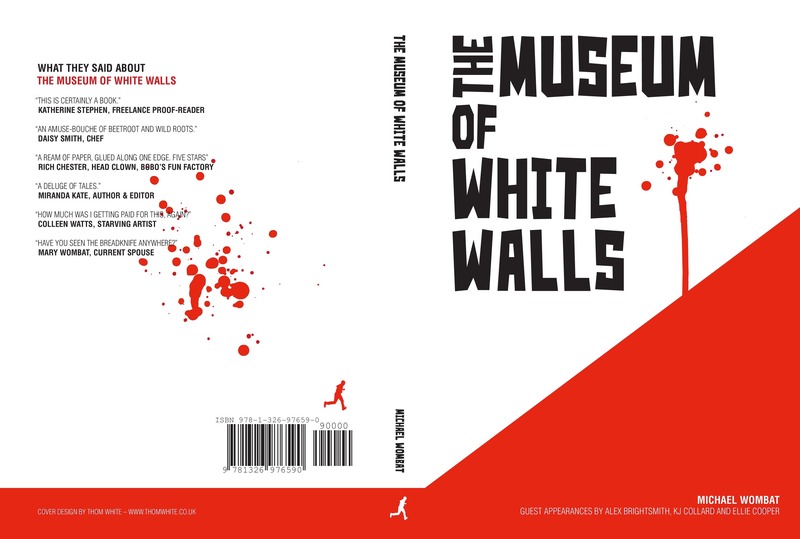 “The Museum of White Walls” will be available on Saturday, for Kindle and in paperback from Lulu (then a few days later on Amazon when it filters through). Thom, you talented bugger.